Welcome to the November 2017 edition of the PXI Newsletter. Our intent is to educate and inform you about how the PXI standard is being used in modular test systems for a wide variety of industries. 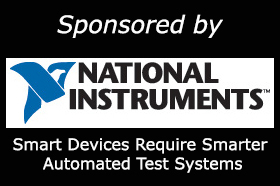 Our thanks go to National Instruments, the sponsor of this month's issue. Oscilloscopes are primarily used for benchtop applications taking advantage of the large fast displays for viewing waveforms. They provide an intuitive user interface with front panel controls so engineers can easily perform waveform acquisitions and measurements. The large displays allow waveform panning and scaling both during and after acquisition completion which is very helpful for debugging. The ability to horizontally split the display to show a zoomed portion of the waveform is commonly supported in scopes and helps search for short anomalies within long acquisitions. It not as widely known, that PXI scopes also provide these usability features. Scope technology, migrated to a modular PXI format has retained many typical scope features, packaged in a smaller footprint, and utilizes the fast PCIe interfaces to maintain a high display refresh rate. PXI oscilloscopes, which are being used more frequently in test applications, use full featured soft front panels (SFP) allowing the same intuitive scope control and waveform visualization. PXI scope SFP’s are designed with the same focus on operator usability as the benchtop scopes, and even include use of LCD touch screen display controls. For example, when combined with a touchscreen display the M924xA scope waveforms can be panned and zoomed with simple touch interactions. The M924xA also supports Zone Touch Triggering which allows easy setup of difficult-to-define trigger events by just drawing a box with your finger. Although the M924xA is a PXI scope, the user interface has been optimized for fast refresh rates. Consumers are continuously demanding better performance, in a smaller form factor, with reduced power requirements. In a world of big data, we have seen a drastic change of digital communication buses shifting from parallel to serial buses starting in the early 2000s. The transition from parallel buses to high-speed serial buses has led to devices with much smaller footprints, much higher data throughput, and lower power requirements – enabling many of the technologies such as SATA, USB, or PCI Express that consumers take advantage of today. This paper is intended to inform engineers on the fundamental concepts for high-speed serial communication links. Pickering expands their range of PXI Microwave Multiplexers with new 50GHz modules (model 40-785B). These are single or dual 6-channel multiplexers with relays mounted on the front panel and are designed to switch 50Ω signals up to 50GHz. The GX7100e Series are 14-slot PXIe 3U/6U combination Smart chassis with a 4x4 Gen2 backplane, and support both external and embedded controller configurations. The combination of 3U and 6U slots provides versatility and flexibility in a compact footprint. Alfamation introduces PVA-01 and PVA-04 PXIe cards supporting respectively LVDS, OpenLDI & V-by-ONE HS™ video standards. Both instruments can manage up to 8 independent channels which can be split or joined, to interface with a single or up to 8 independent devices, each at 1080p equivalent resolution. PXI FlexRIO Coprocessor Modules feature high-performance FPGAs that add signal processing capability to PXI systems. These modules leverage the latest FPGAs from Xilinx, streaming technologies such as PCI Express, and NI Peer to Peer Streaming for high-bandwidth data communication with other modules over the backplane. The M9341A digital I/O with the 24-bit digital I/O connector and triggering ports provides communication signals between the PXI vector Network analyzer (VNA) installed in the same PXI chassis and an external handler. This allows the PXI VNA such as the Keysight M937xA and M9485A to be used in an automated test environment.